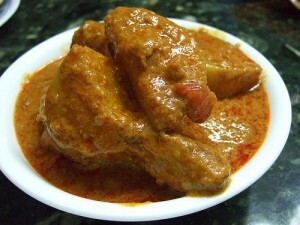 Chicken Nizami recipe by Nazia Nazar at DesiRecipes.com. Put together all the ingredients from the cummin seeds to the cinnamon nad grind to a fine paste. Extract the milk from the soaked coconut ands ser aside. Heat the saffron for 2 seconds in the microwave or on a girddle, crush it, and soak it in the hot milk. Heat the oil and fry the onion till it is golden brown. Add the ginger / garlic and fry for couple of minutes. Add the ground paste and bay leaves. approximately 20 minutes, over a low heat. When the chicken is almost cooked, add the coconut milk, green chillies, coriander leaves and yogurt. Cook till the chicken is tender. Simmer for 3 minutes or until the gravy gets a creamy consistency. Garnish with coriander and serve with chapattis..